As I was setting up for the Blue Christmas service on Thursday, one of our young Daisy friends came into to see what I was doing. She was very taken by our nativity over here. She came over and we talked about all of the characters in the Nativity, from animals to the guy holding fish who hangs around this particular nativity. Her mother told me earlier on that the story was probably not that familiar. The young friend was most curious about the winged friend on top the stable. Who is that? She asked. Gabriel, I replied. Gabriel, the angel. Told Mary, the mother and Joseph, the daddy that they would have Jesus the baby who was from God and was God (talk about a quick theology lesson!). It looks to me like the tooth fairy, she told me. I want to talk to the tooth fairy, she said. I gestured towards the angel. She touched the angel and was delighted when the angel sang on cue Away in a Manger. Tooth Fairy, can you make sure that Jesus doesn’t always stay a baby? I would like for him to grow up. She asked. Most interesting. She later told me she wanted Jesus to grow up, so she could play with him. Don’t we all want more time with Jesus? But back to my friend, Gabriel, it seems that there is a lot of confusion, not just from children, but in the wider community about what angels DO! Is it wish granting or future telling? Is it good news sharing or protecting? Is it teeth gathering or urging children to grow up? 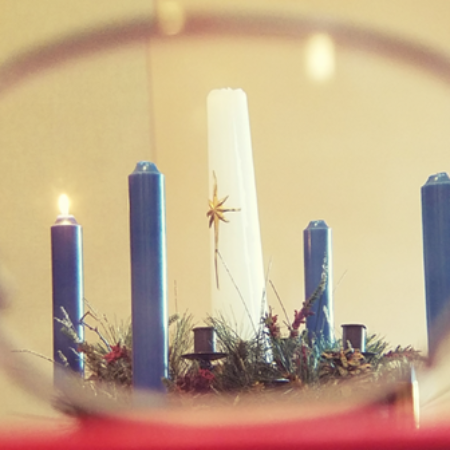 On this fourth Sunday of Advent, I want to pause for a moment to focus on the essential role of the evangel, the angel, the bringer of good news and bright tidings. We hear this in our gospel lesson through the person of Gabriel, and we, too, are called to be evangels to the world! Throughout our biblical witness, we read of angels who are messengers of God sharing the words of God with the people of God. Our hymns and carols pick up on these themes as we sing: Angels we have heard on high, Hark the Herald Angels, Angels from the Realms of Glory. Gabriel spoke to Mary, Joseph, the shepherds, and perhaps, others to announce the birth of Jesus. The nativity story of Jesus moves forward on the wings and voices of Gabriel and other angels. The eyes through which we see the nativity story today, is Gabriel. The barest of Nativities is Jesus, Mary, and the angel. Gabriel makes the top three. And it is the annunciation that begins the visible part of this earthly journey from Gabriel’s lips to Mary’s ears. Annunciation is the proclamation that Mary who was not expecting any news at all, found out that she would bear the God. Gabriel begins his holy task with honored greetings. Have you ever received one of those phone calls where the caller has already begun the conversation without you? I heard in my ear the other day as I answered the phone. I looked at the phone. I had just answered the phone for a number with which I was not familiar. How different that greeting is from Gabriel. We might hear it this way: Good morning, chosen one of God, God is already with you. No misdials, wrong numbers, or pocket dials here! From God, Gabriel has incredible news to share; however, you and I have something to learn from the way Gabriel deliver news. It is offered at the rate the hearer can receive it. Gabriel offers Mary good news at a rate she can comprehend. Gabriel waits while she asks questions. Answers her questions kindly confidently and without dismissal. Gabriel’s good news brought out incredible courage in Mary. Mary ultimately says, here I am. Let it be as God has said. As we share the good news, we can walk beside others as they find courage to face the future with hope. Courage in out ordinary lives. Courage for new diagnoses and waiting for diagnoses. Courage for standing up for yourself and courage to include others. Annunciations come every day. We are all called to carry God in one way or another. Some of us are called to carry the good news that Jesus desires for everyone to be filled and no one to go hungry. Some of us are called to carry the good news that God’s world intends for no one to feel lonely. Some of us are called to carry the good news that worlds ways are not necessarily God’s ways and the arc of the moral universe is long, but it bends toward justice. We think Gabriel most commonly with the Christmas story and place him aptly in the manger. But does anyone know what other biblical story he makes an appearance? Gabriel also brings good news to Daniel. As Daniel is praying for the people, Gabriel brings the message of God and proclamations of God (in Daniel 9) with hope for the future. For Gabriel, this work of sharing God’s good news is his life long work. In fact, for us, it is as well. We might not be Gabriels, but we, too are called to share the good news of God. We are called to greet one another with God’s presence. This is the origin of the passing of the peace. To recognize that the presence of the Lord is already moving in someone else’s life, The Lord IS with you, instead of The Lord BE with you. Who is God calling you to share good news with this day? Good news that while Jesus might appear to be a baby in a manger (this seemed to worry my Daisy friend quite a bit), he has indeed grown up and continues to change our world. Who needs to hear that God’s very presence will set about comforting the lonely and feeding the hungry, begin righting the wrongs and turning the upside-down world right side up? Listen for God is calling you, Favored One, Beloved. God is calling you to be an evangel to share the good news that God is coming to be among us, to live among and the change our world back to God’s way. The angel said to her, ‘The Holy Spirit will come upon you, and the power of the Most High will overshadow you; therefore the child to be born will be holy; he will be called Son of God. And now, your relative Elizabeth in her old age has also conceived a son; and this is the sixth month for her who was said to be barren. Then Mary said, ‘Here am I, the servant of the Lord; let it be with me according to your word.’ Then the angel departed from her. Sunday: “But the angel said to them, ‘Do not be afraid; for see—I am bringing you good news of great joy for all the people: to you is born this day in the city of David a Savior, who is the Messiah, the Lord. This will be a sign for you: you will find a child wrapped in bands of cloth and lying in a manger.’” Luke 2: 10-12. Look to the heavens today and then all around as Jesus is born among us. Monday: “But Mary treasured all these words and pondered them in her heart.” Luke 2:19. On this Christmas day, give thanks to God for Jesus. Tuesday: “The shepherds returned, glorifying and praising God for all they had heard and seen, as it had been told them.” Luke 2: 20. Who will you share the good news with today of you have heard and seen? Wednesday: “And Gabriel came to her and said, ‘Greetings, favored one! The Lord is with you.’ But she was much perplexed by his words and pondered what sort of greeting this might be.” Luke 1: 28-29. Our internalized images often push us so far down that we see ourselves as less than God sees us. Hear God’s greeting to Mary. God also greets you with joy! Thursday: “The angel said to her, ‘Do not be afraid, Mary, for you have found favor with God.” Luke 1:30. The presence of God can frighten us, but God begins with delight in us. God’s calls for us are grounded in favor; then challenge us to step out of fear. Where is God calling you? Friday: “For nothing will be impossible with God.” Luke 1: 37. Pray today for your vision of possibility to grow. Saturday: “Then Mary said, ‘Here am I, the servant of the Lord; let it be with me according to your word.’ Then the angel departed from her.” Luke 1:38. Mary models for us a life lived in dynamic faith. Mary wondered with God and followed God’s way. She asked questions and found God’s path. Those are not in opposition. Where is God calling you into deeper relationship?